It's my turn to host the challenge this week at The Shabby Tea Room : ) I found the most beautiful jewelry at Roses and Teacups, this gorgeous bracelet caught my eye and so it's the inspiration for this week's challenge - Pearls and Pastels !! This week's sponsor is JustRite and there's a fabulous prize up for grabs - Christmas Nested Frames and Christmas Nested Sentiments sets plus Clear Horizontal Stamper!! JustRite kindly sent the Shabby Girls some stamps to play with and I used the Nested Sentiments on my card with the Clear Horizontal Stamper, wow they're pretty cool, loving the grid on the block, the stamp snaps right in, perfectly straight!! 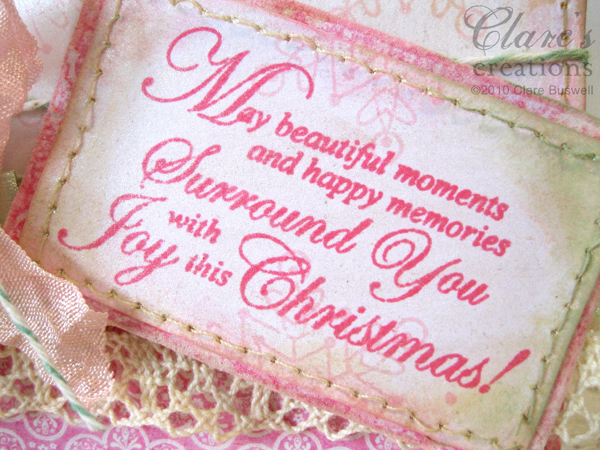 I also used stamps from the Whimsical Christmas set to create the background of my card. Recently my friend Lenet made a Pink Christmas card, it was beautiful and I just loved the idea of using non-traditional pink for the card, so I did! I created the snowflake background paper by painting some white card with Ivory Creative Inspirations Paint and stamping the snowflake image from the Whimsical Christmas set by JustRite in Memento Angel Pink. I rubbed the ink pad over the edges of the card too. The pretty paper at the bottom is from My Mind's Eye. 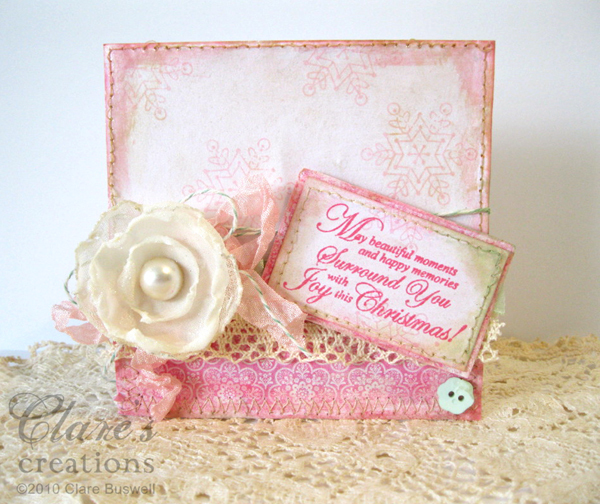 I used one of the sentiment stamps from Christmas Nested Sentiments & Verse by JustRite and stamped in Memento Rose Bud, I really loved the sentiments in this set, I'll be using these a lot for my Christmas cards!! I stamped more of the snowflakes in the background. I added a touch of green by distressing the edges with VersaMagic in Sage. I also used the CI Ivory paint on the background too. I used one of my Shabby Flowers that I made - tutorial finally here!! Just pop over to The Hybrid Chick to see it, they're so easy to make!! Just so you can see how shimmery the card really is, I took another pic! Pink and pearly shimmer.... so pretty together!! : ) I also added a touch of stitching, some vintage lace, shabby pink seam binding and a little green and white baker's twine! I think I'll be making more pink Christmas cards!! Oh yea almost forgot, JustRite is hosting the Twelve Weeks of Christmas Blog hops each Wednesday through Thanksgiving - Wonderful Christmas project inspiration from lots of different designers each week. Details at the JustRite Inspiration blog. You simply have to check out what the rest of The Shabby Tea Room DT came up with this week, simply fabulous!! 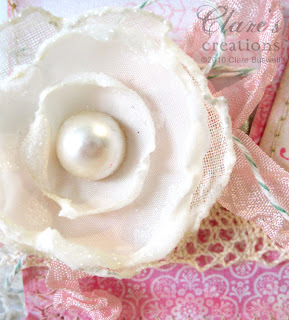 Other: Lace, pale green satin ribbon, green and white Baker's twine, button, pink seam binding, shabby flower, sewing machine, Creative Inspirations Paint in Ivory. Clare, I just love those flowers. I really have to find the time to try out the tutorial! Oh, pretty card Clare. Those flowers are gorgeous. so soft and pretty. the flower is so beautiful! Love the soft coloring of the card! Simply gorgeous, what a wonderful photo and creation, I definitely make one for the challenge this week, and that flower, pretty! Beautiful card, Claire! I love your beautiful flower as well! You seem to like the soft color pallette, that is nice to know! 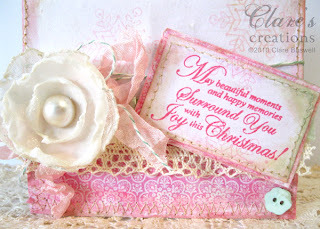 I love, love, love pink Christmas, Awesome! This is fabulous. I llove every detail and piece of it. Breathtaking...! I already looked at your flower tutorial and I'm going to try to make some myself. 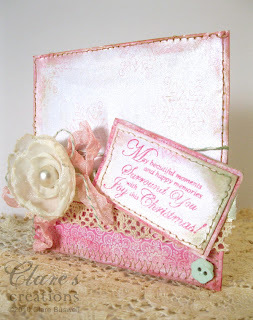 Very pretty card, love the handmade flower, and all the little details, loving the pink too. This is one stunning card!!! I am totally in love with this color for Christmas! I love the beauty of the pale snowflakes in the background and the gorgeous flower! Just stunning!! This is absolutely gorgeous!! 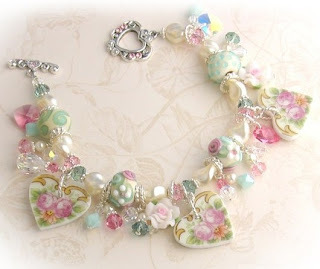 So pretty and delicate.!! Thank you for the flower tutorial! Im off to buy me some fabric!